At a ceremony in Garching bei München, Germany, ESO signed the contract with the ACe Consortium, consisting of Astaldi, Cimolai and the nominated sub-contractor EIE Group, for the construction of the dome and telescope structure of the European Extremely Large Telescope (E-ELT). This is the largest contract ever awarded by ESO and also the largest contract ever in ground-based astronomy. This occasion saw the unveiling of the construction design of the E-ELT. The European Extremely Large Telescope (E-ELT), with a main mirror 39 metres in diameter, will be the largest optical/near-infrared telescope in the world: truly the world's biggest eye on the sky. 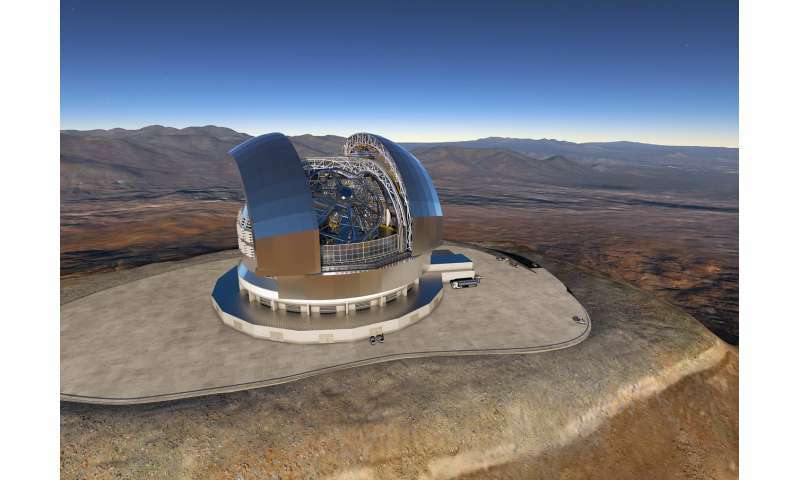 It will be constructed in northern Chile, on a site that has already been prepared. The contract to build the telescope's dome and structure was signed by ESO's Director General, Tim de Zeeuw, the Chairman of Astaldi, Paolo Astaldi, and the President of Cimolai, Luigi Cimolai. ESO was delighted to welcome Italy's Minister of Education, Universities and Research, H.E. Stefania Giannini, to the ceremony, which was also attended by the Italian Consul General in Munich, Renato Cianfarani, the ESO Council President, Patrick Roche, and the Italian ESO Council Delegates, Nicolò D'Amico (who is also President of INAF and Matteo Pardo, Scientific Attaché at the Italian Embassy in Berlin. The President of EIE, Gianpietro Marchiori, and other guests and representatives of the consortium were also present. The contract covers the design, manufacture, transport, construction, on-site assembly and verification of the dome and telescope structure. With an approximate value of 400 million euros, it is the largest contract ever awarded by ESO and the largest contract ever in ground-based astronomy. The E-ELT dome and telescope structure will take telescope engineering into new territory. The contract includes not only the enormous 85-metre-diameter rotating dome, with a total mass of around 5000 tonnes, but also the telescope mounting and tube structure, with a total moving mass of more than 3000 tonnes. Both of these structures are by far the largest ever built for an optical/infrared telescope and dwarf all existing ones. The dome is almost 80 metres high and its footprint is comparable in area to a football pitch. The E-ELT is being built on Cerro Armazones, a 3000-metre peak about 20 kilometres from ESO's Paranal Observatory. The access road and leveling of the summit have already been completed and work on the dome is expected to start on site in 2017. Tim de Zeeuw, ESO's Director General said: "The E-ELT will produce discoveries that we simply cannot imagine today, and it will inspire people around the world to think about science, technology and our place in the Universe. Today's signature is a key step towards delivering the E-ELT in 2024." Paolo Astaldi, Chairman of Astaldi added: "This project is truly visionary, both in what it represents for the field of astronomy and for construction and engineering. Astaldi and our project partners, Cimolai and EIE Group, are extremely proud to have been selected by ESO through their call for tender to help make their vision a reality. Astaldi is renowned for delivering its best-in-class technical skills, quality construction and strong execution, and we will put the full force of our core strengths behind this project. It is with great excitement that I sign a contract of such astronomical ambition." Luigi Cimolai, President of Cimolai, said: "We are honoured and grateful that our company has been given the opportunity to take part in this technically advanced astronomical challenge. The European Extremely Large Telescope will demand a high degree of quality in engineering and construction and I believe this will definitely contribute to further increase our ability to develop projects of greater and greater complexity." Many other aspects of the construction of the E-ELT are also moving forward rapidly. ESO has already signed agreements for the construction of the first-light instruments MICADO, HARMONI and METIS, as well as the MAORY adaptive optics system for the E-ELT. Contracts for the telescope's huge secondary mirror will be signed in the near future. The light-collecting area of the E-ELT will be bigger than all existing optical research telescopes combined and its adaptive optics system will provide images about 15 times sharper than those from the NASA/ESA Hubble Space Telescope at the same wavelength. It offers numerous possibilities for technology and engineering spin-offs, technology transfer and technology contracting. The new contract demonstrates that the E-ELT has the potential to be a powerhouse for economic development, offering contractors in ESO's Member States an opportunity to lead major projects at an international level. At this rate E-ELT might end up being both the most ambitious and the first of the new generation of extremely large ground based telescope. For a while it looked like it would be the last. It's an big step in the right direction. Only 8 years to write a proposal.